This is Saravanan Parasuraman’s first exhibition outside of India where the artist lives. 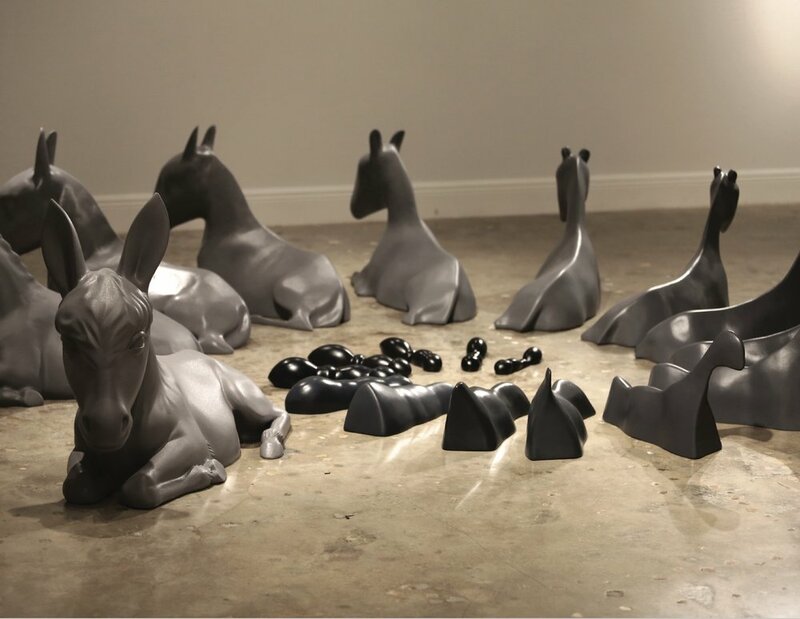 The five works on display—all produced specifically for the FIU College of Architecture and The Art’s Miami Beach Urban Studio Gallery—are made of materials ranging from silicone and fiberglass to graphite and steel balls. This breadth of material investigation is consistent with Parasuraman’s belief that ideas and concepts drive his practice rather than being bound by a single medium. The major conceptual thread running through the works is an exploration of the blurred boundaries between the metaphysical and the physical, the corporeal and inorganic, and randomness and order. The installation allows viewers a copious amount of space to interact with the work—that is, space is generative not negative—and underscores the artist’s interest in foregrounding the relationship between bodies and objects. A visitor’s path, too, is left more ambiguous than fixed. The complexity of the works lie as much in their obscurity as in their subtle (but always elusive) reference to contemporary politics in South Asia or even the fishing culture of Chennai.